Brilliance, utter brilliance. 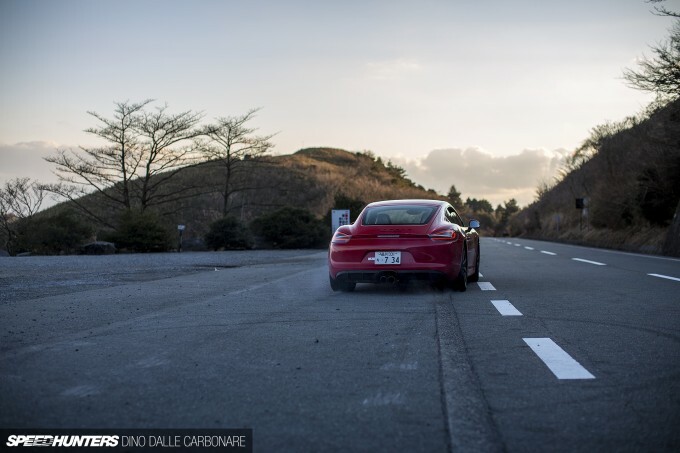 That’s what I kept thinking to myself as I steered the Cayman GTS through the turns that make up the Izu Skyline – a beautifully scenic road that crests the Izu Peninsula south of Tokyo. 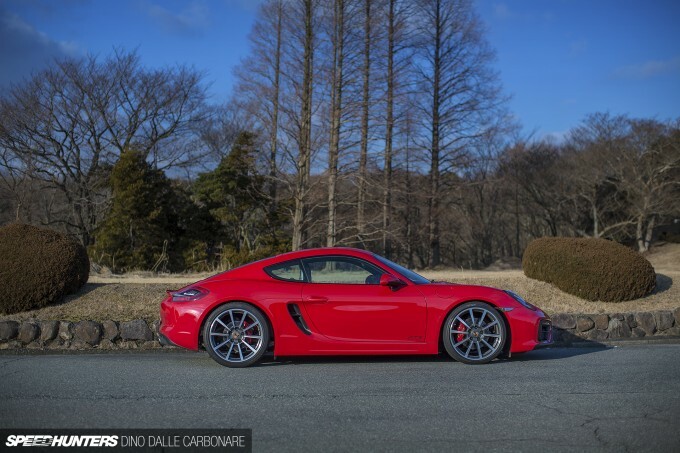 In a world far too consumed with outright numbers, the Cayman and Boxster have always managed to provide driving excellence through a fine mix of performance and outright balance. 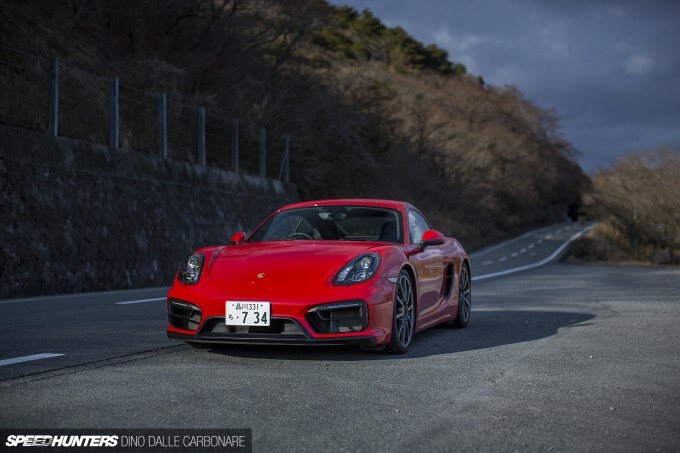 With the GTS, Porsche has upped the ante by throwing pretty much every single option you could possibly add to a Cayman S, and then finished it off with a 15hp bump in power. That might not sound like a lot, but in the real world let me tell you that it is. 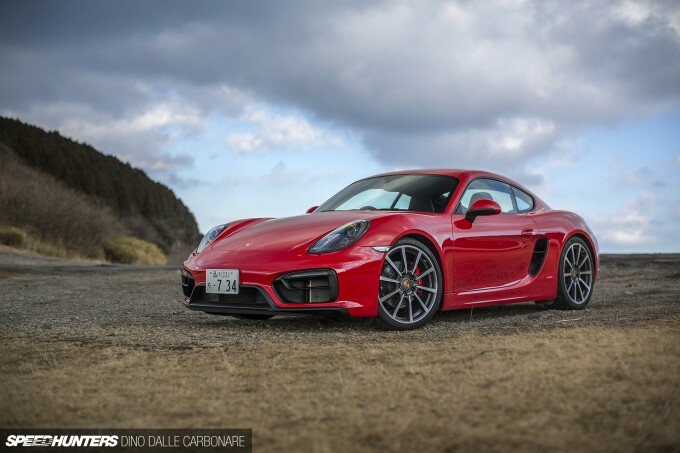 The Cayman’s flowing exterior gets a few little touches of aggression in this guise, and it all combines to create a look that’s menacing yet elegant. Should you want your baby Porsche to visually scream a little louder, the recently announced GT4 version is the car you should probably be considering. We’ll be putting that version to the test as soon as we can get our hands on one. 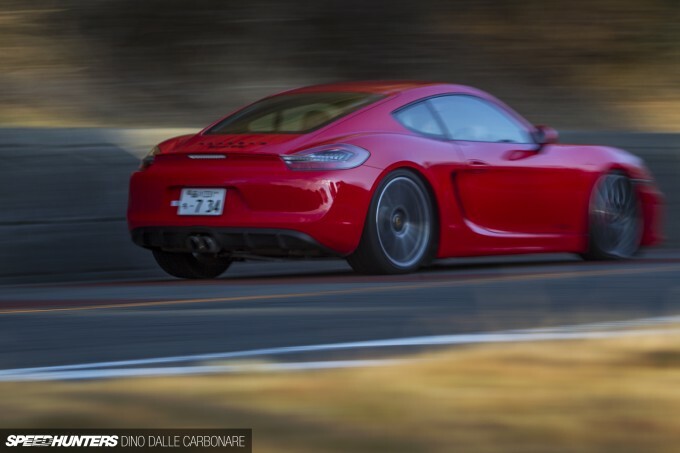 Don’t let the addition of the track-oriented GT4 to the Cayman line-up take anything away from the GTS, because this is a supreme driver’s car and it shouldn’t be brushed under the carpet just because it’s not as powerful – and I’ll tell you why soon. But back to the visuals, up front the GTS boasts a redesigned bumper complete with black contours around the grille and splitter, and big lateral openings. The headlights are given a more bespoke touch by having their inner sections blacked out – something that works really well against the Carmine Red body of this press car. 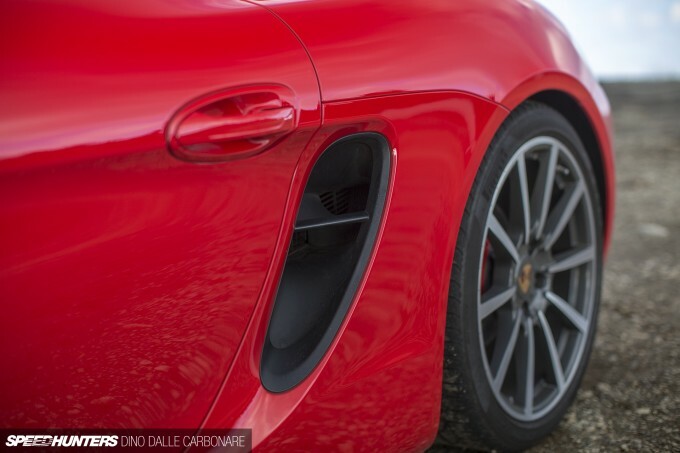 The side intakes are another reminder of where the engine in the Cayman actually sits. That is, tucked deep within its chassis, offering the unmatched feel and sensation mid-mounted setups always have. 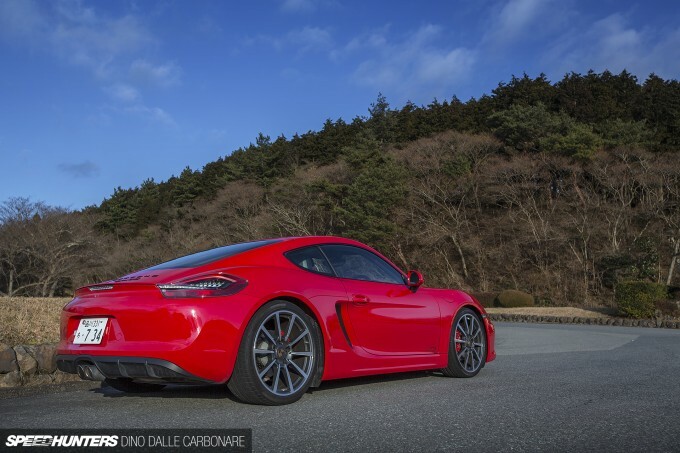 There isn’t a great deal else that visually distinguishes the GTS over the regular Cayman or S models, except for the fact that the car comes with the sports exhausts as standard – something that is an option on the other versions. Oh yes, just in case you forget, there’s always the badge on the rear gate to remind you that you are in fact driving the GTS! From this vantage point at the very top of the Izu Skyline you get some seriously breathtaking views overlooking Numazu City and Suruga Bay in the distance. It was a pity that Mt. Fuji was hiding under a thick cover of cloud this particular day though. 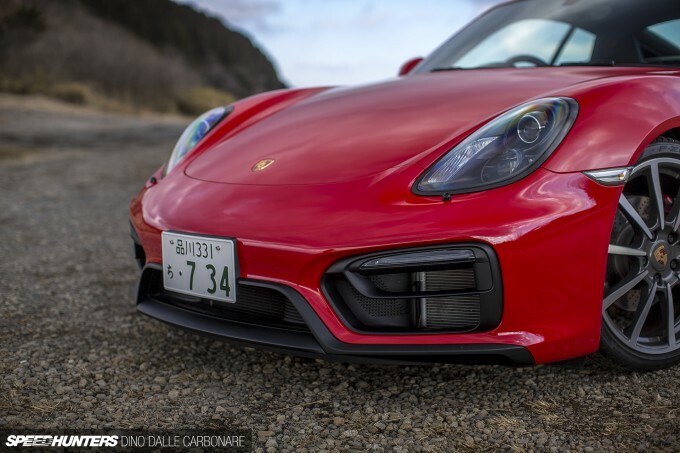 I remember mentioning this on my original drive of the Cayman S a couple of years back, but I’m of the opinion that 20-inch wheels are a tad too big for the car. 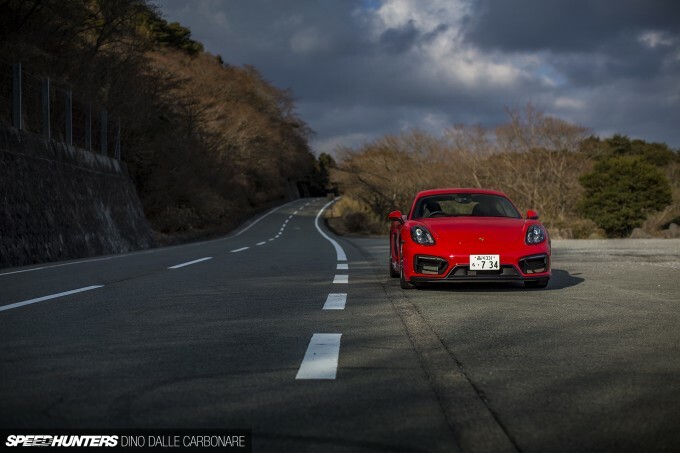 The GTS gets them as standard, and shod with Pirelli P-Zero tyres they feel great through the turns. Porsche obviously developed the car from the outset with these size wheels, but from a purely visual standpoint, I think 19s would probably do the car more justice. One thing I was very happy to see however, was that the car wasn’t fitted with the optional carbon-ceramic brakes. On the Cayman S press car, where they were optioned, I found them to be too grabby and hard to modulate when attempting smooth heel and toe. That has nothing to do with the performance of the brakes, but I think they’re just more suited for people that intend to track their cars often. These standard spec steel brakes in comparison were a joy to use, and if the car wasn’t fitted with an automatic rev-matching system on the downshifts (something I first saw on the Z34 370Z years ago), it would have been far easier to judge and execute your very own ‘manual’ heel and toe dance. A car should look and feel just as special as it does on outside, inside. Here, Porsche really hits the proverbial nail on the head every time. The GTS cabin has the usual Porsche layout with the raked transmission tunnel that rises up to integrate with the center console. The result is an enveloping driving position, and as you grasp the thick rim of the steering wheel all your commands are within perfect reach. 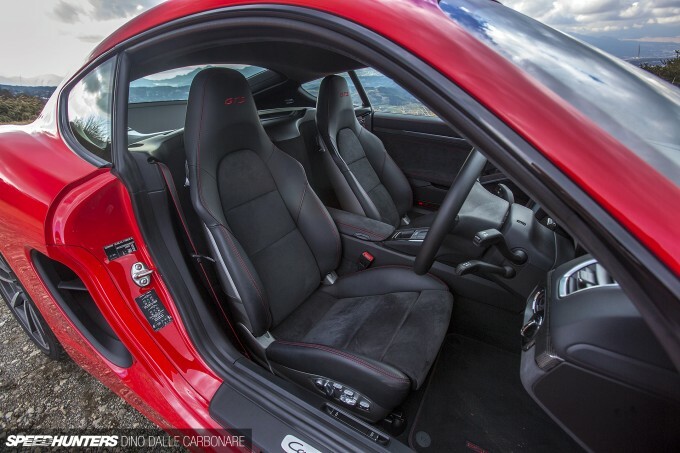 The GTS’s seats are the highly bolstered sport items that are offered as an option on the rest of the range. They’re just what you would want for a car of this caliber, supportive yet comfortable and adjustable, which makes finding the perfect driving position very easy. 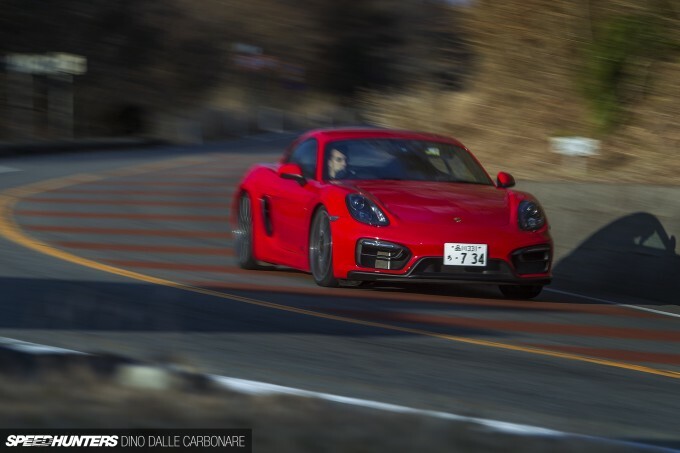 I’ll commend Porsche Japan for selecting the 6-speed manual gearbox for this press car, as it’s the must-have transmission for anyone wanting the truest driver-oriented GTS! The manual, although not as fast as the twin-clutch, is as sweet and precise as you would ever want a gearbox to be. 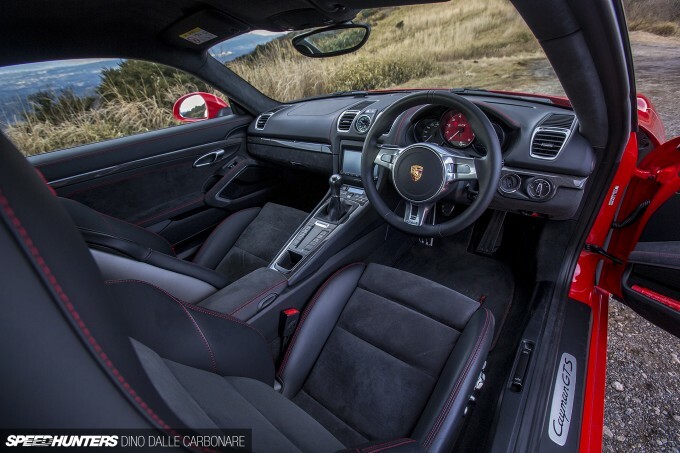 The GTS’s cabin is made that little bit more special with soft suede covering much of the interior. There’s also red stitching to keep it in tune with the performance oriented feel of the car, and of course to match the big red tacho that takes center stage in the instrument binnacle. 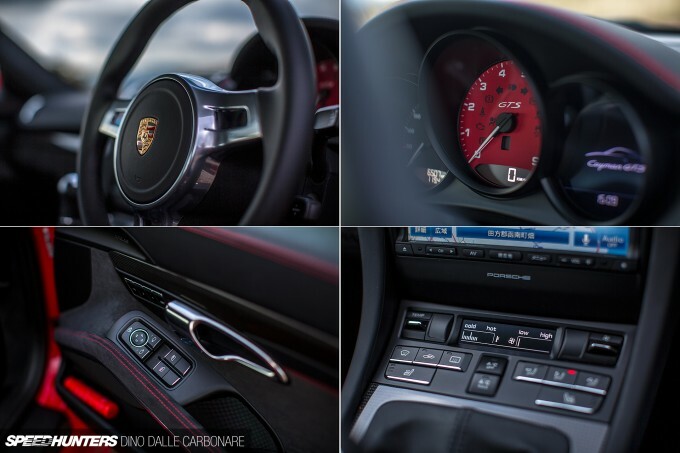 The only real disappointment – just like on every other Porsche sold in Japan – is the lack of full integration when it comes to the navigation and infotainment system. I don’t get why it’s taking Porsche so long to dump the ugly double-DIN aftermarket units they fit their cars with, and to come up with something more akin to what they fit to cars sold in Europe and the US. 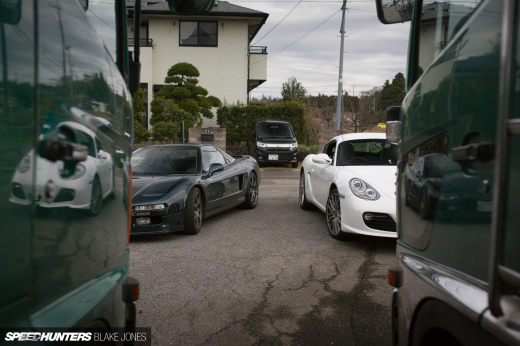 It’s something Porsche customers complain about in Japan, so is definitely an area they need to work on. Adding the Porsche logo to an Eclipse navigation system just doesn’t cut it at this price point! With the engine tucked deep behind the rear seats, there isn’t much to look at once you lift up the rear gate – except for the little trunk space, which of course is joined by a much larger ‘frunk’ up front. 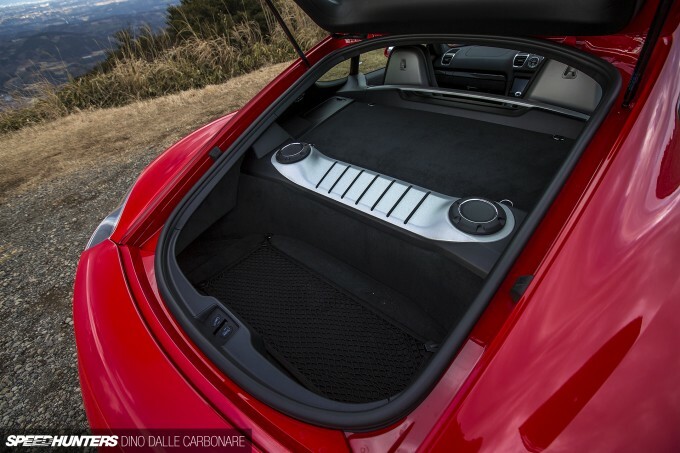 But who the hell cares about trunk space on a car that was designed to be thrown around corners. And for that, I had definitely come to the right place, as the Izu Skyline on a cold winter’s weekday is nothing short of a deserted dream road. 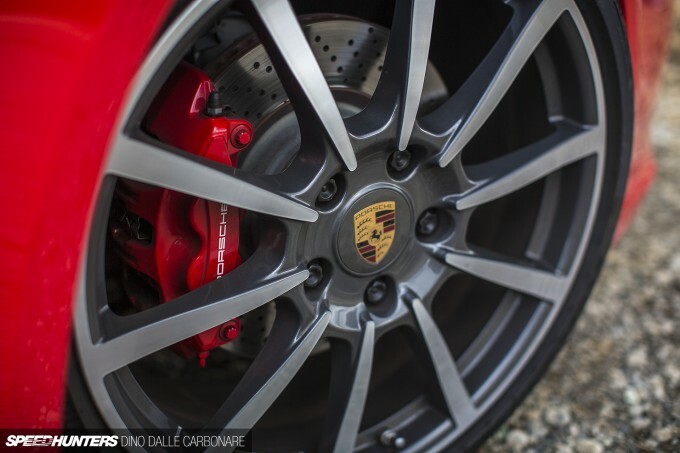 So, with an aggressive clutch drop to take full advantage of the Cayman’s mechanical grip, I was off. 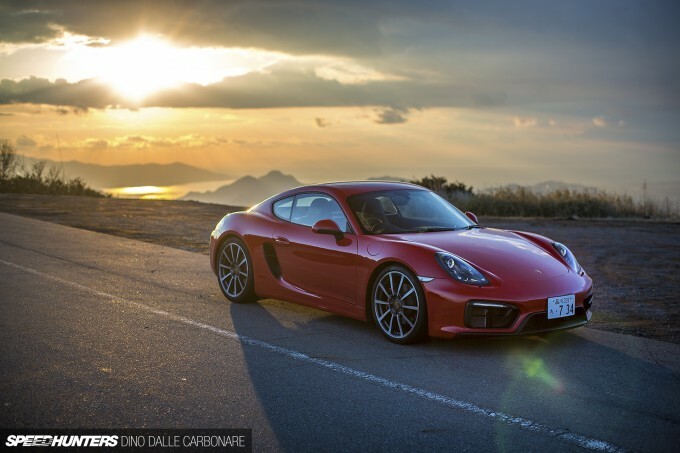 The 3.4L flat six in the GTS develops 100hp per liter for 340hp of high-revving glory. While there’s a very nice broad spread of torque even at low RPM, the engine always invites you to rev out every gear to the redline, which is set at 7,600rpm. 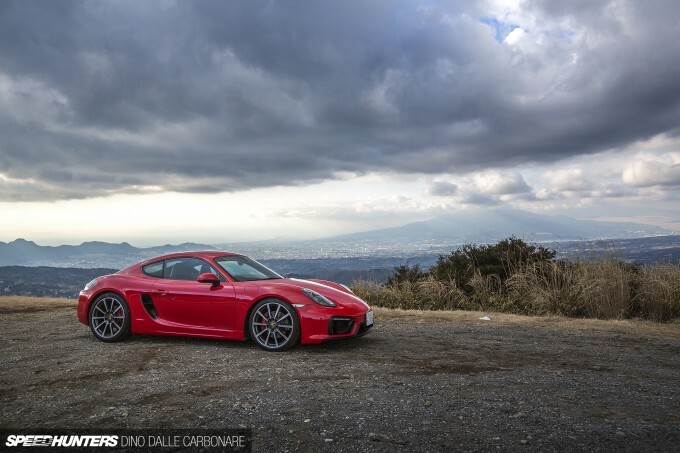 Second and third are all you need to tackle the majority of the twists and turns of the Izu Skyline, and finding a rhythm isn’t hard with the GTS. 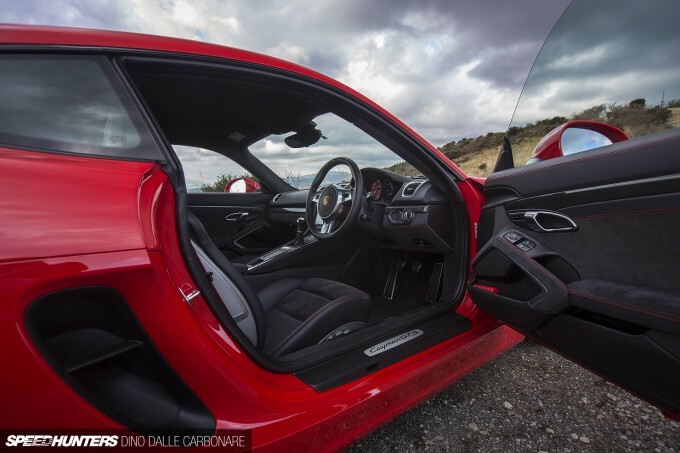 You get into a real synergy with the car – digging deep into the corners by dosing your brakes perfectly, backing off gently but briskly so as not to upset the chassis at its limit, and the equally smooth way you get back on the power and accelerate out of a bend unleashing all the might of the engine. To throw the GTS around is a beautiful thing. Quick breaks are important – they always are for us Speedhunters as we try to capture as much of our voyage with a car as we can. But they also give use time to reflect and take it all in. After all, capturing a car like this in its element is as important as letting it do its thing on the road. The raspy sports exhaust is sublime when left in its ‘open’ setting. 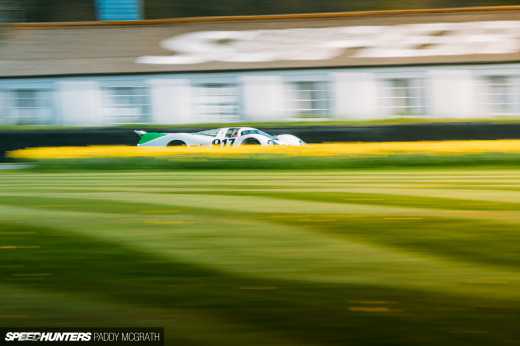 The flat six scream away as the revs climb, violently barking when blipping the throttle on downshifts and burbling away on the overrun. 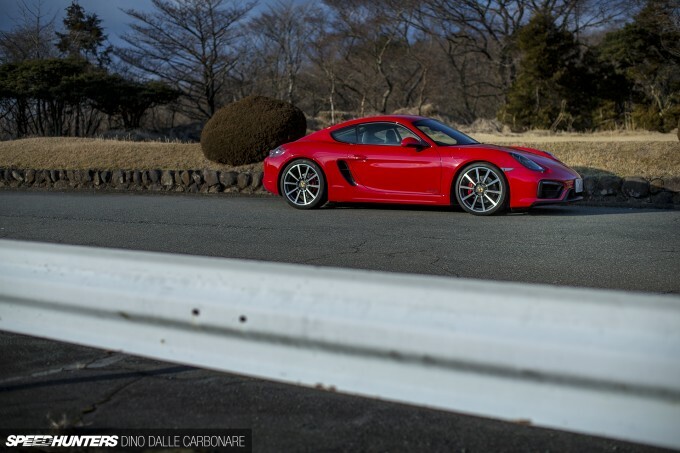 What has taken Porsche engineers generations to get right with the 911’s handling, the Cayman does naturally. 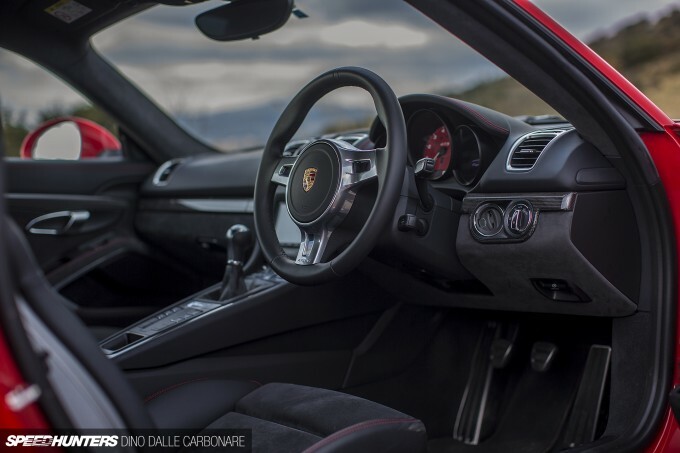 The mid-engine layout gives the GTS a very special character – it’s beautifully neutral, always willing to turn in without fuss, and rewarding with great feedback. The sheer grip available means the car is always planted, but with the stability control turned off there is a wonderful play that you can tap into. It all moves around and rotates under you in a way that strangely inspires confidence rather than scaring you away. You can fine tune your line, adjust it mid-corner, and on the tighter turns kick the tail out as you exit under power. The GTS rewards finesse, it makes you a better driver and helps you hone your skills behind the wheel. What else could you possibly ask of a sportscar? 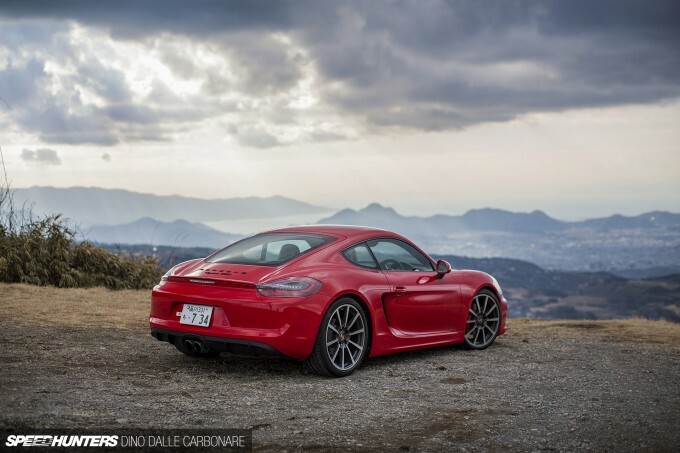 I spent an entire afternoon doing my best to empty a tank of gas – something which isn’t that easy to do in a Cayman as this is a car that delivers pretty damn good fuel economy, even when you are driving at serious lick. 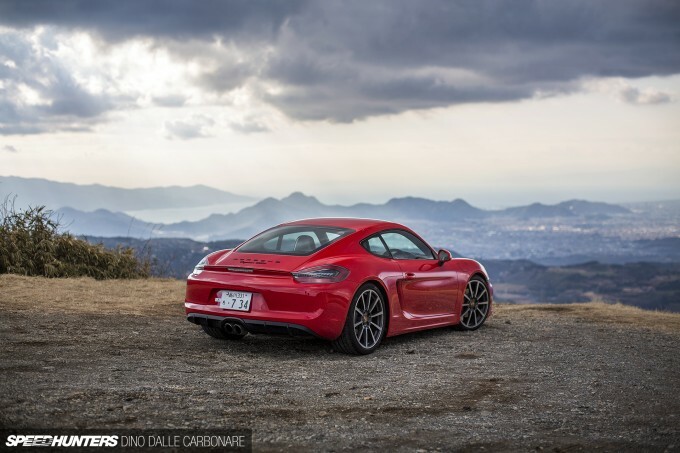 The GTS is a great interpretation of the Cayman – a car with many talents that shines at pretty much everything it does. 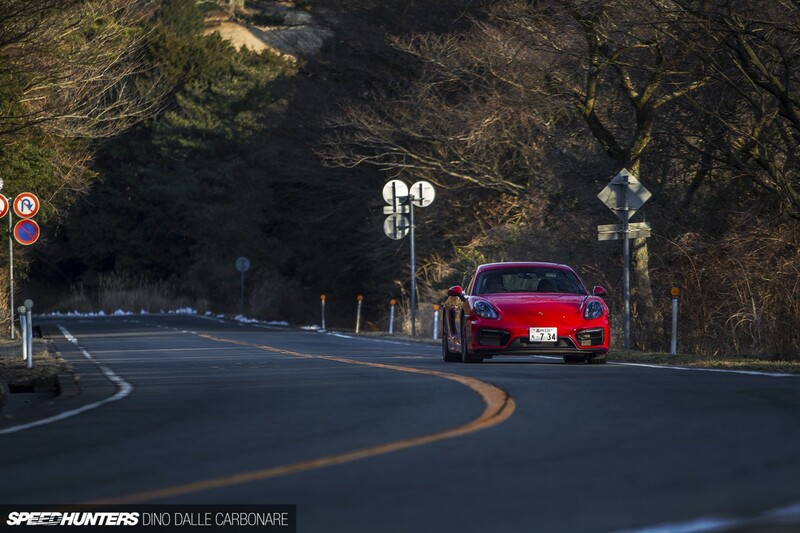 It is unavoidable to end this drive without wondering how the GT4 will compare. After all, that’s a car that shares a lot of suspension components with the 911 GT3 and comes with a bigger, more powerful engine to boot. It’s a good thing Porsche has continued to make the 911 so much better over the years, because these lighter, mid-engined cars have always continued to edge ever so closer to upsetting the pinnacle of the brand. 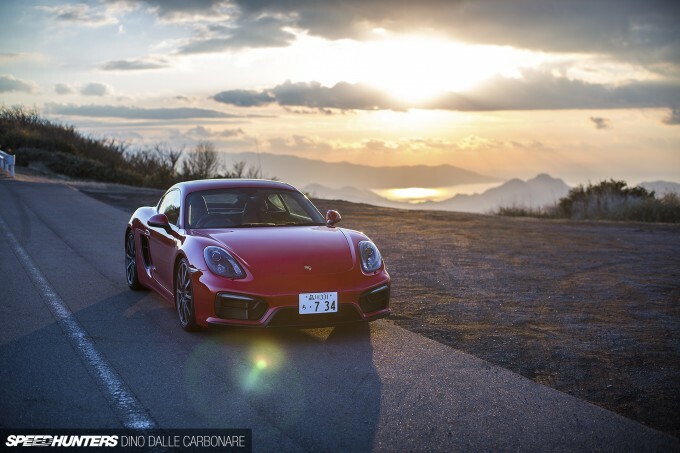 It just seems Porsche can do no wrong. This looks heavenly Dino. Not jealous at all! Dreamy images too. whoahwhoahwhoah I just noticed the "coming soon" pics at the bottom of the site. DON'T DO THIS! idk how long that's been going on, but I dont like it either way. Let me have some surprises in my life please. These days people leak stuff, hold announcements that theyre going to announce something, and then leak the thing again. If the same thing happens to my favorite car blog then I'm just going to dig a hipster grave and lie in it. Why do we need to see what's coming up next? It's coming up....next... Totally spoils the surprise, now I know what kinda cars i'll be looking at soon. where's the joy in that? I love the cayman though. I like what you said about that and the boxter being very well balanced. I think people don't drive then as much as the 911 (imo, what i see driving) because of the price points. They want a status symbol (as if a base 911 is one...). They'd find more fun in the smaller models though, i think. 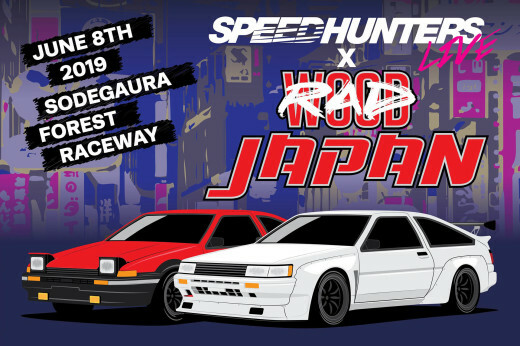 I would love to see more of these modded on speedhunters. I'm so jealous! I've never driven a Porsche and haven't even seen the current model Cayman before me, yet I'm so in love haha ...and the quality of Australian roads just don't compare to those of Japan and California. I'm gonna kick the guy who called this car Cockster in the nuts. Especially after reading this. I wouldn't be surprised to see Porsche trying to steal that next-to-last photo for their own press. Great shots as always and looks like you had a blast! 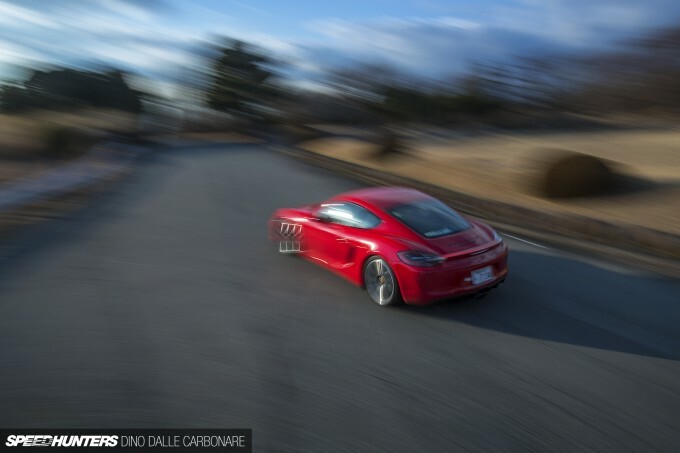 The only reason the Cayman isn't outright faster than the 911 is because Porsche wants it that way. 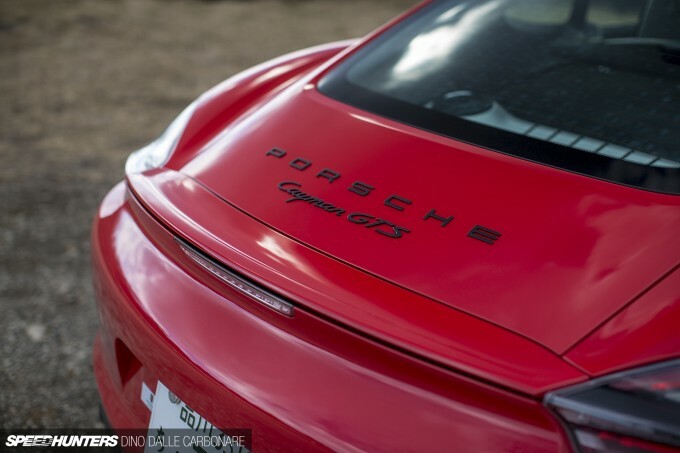 if they put their considerable engineering might behind a MR setup instead of the 911 id wager it would clean up despite the jeers from the Porsche owners club. Love it. Want it. Would be a perfect daily/all rounder. Excellent pics! I agree with you on 19" wheels. Beautiful as usual but i bet a gt wing would look great. I will remember the http://www.archeagegoldmall.com/ ancient law of averages and I will bend it to my good. I will persist with knowledge that each failure to sell will increase my chance for success at the next attempt. Each nay I hear will bring me closer to the sound of yea. Each frown I meet only prepares me for the smile to come. Each misfortune I encounter will carry in it the seed of tomorrow's good luck. I must have the night to appreciate the day. I must fail often to succeed only once. A very pretty car, love the way the rear lights are integrated with the lip spoiler. is there a prettier sportscar out there at the moment? Wow. Sensational shots. This is what Porsche should have released initially...lust. This car makes me feel tingly in my happy places. zapsnyder Absolutely, the pinnacle of Porsche racecars and supercars have been mid-engined for a long time, I think it will be interesting to see how the GT4 compares on same tires as the 911 GT3. I think it will not be long until we see start seeing people picking up 1st gen Caymans and swapping in GTS, GT3 and Cup engines! I actually went to have a look at Porches today and I found the base-model Cayman to be pretty ordinary. 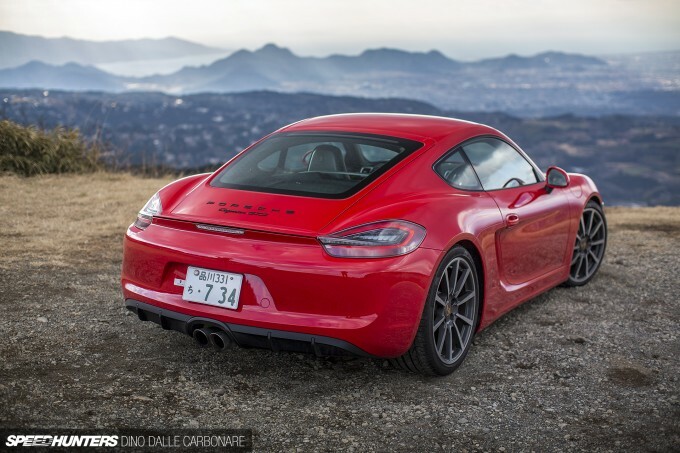 The GTS sure is a nice car but when a used 2014 911 isn't too much more, I'd choose the 911. This has rear seats?! Proofreading? !